Americans use of public libraries and generally positive attitudes about them cut broadly across all demographics surveyed. However, for lower-income Americans and those who are members of communities of color, libraries have a special role as places to learn new job skills, explore new digital technologies and provide services to them or their community. 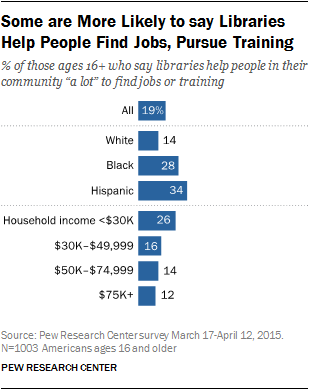 When it comes to economic opportunity, African Americans, Hispanics and those in households with an annual income under $30,000 are more likely to say libraries help people find jobs or pursue job training. Hispanics, in particular, are more likely than the overall population to say libraries help “a lot” or “somewhat” in job pursuits or training by a 58% to 48% margin. 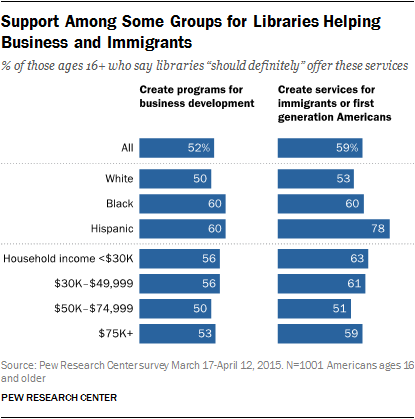 These groups are also generally more likely to say libraries should “definitely” create programs that encourage business development or help immigrants or first-generation Americans. 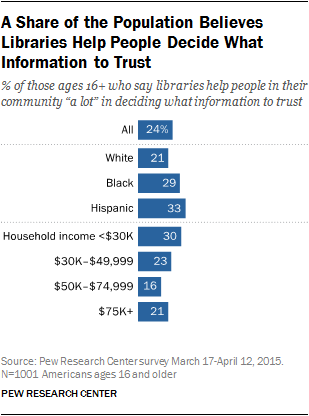 As noted, Hispanics feel strongly about libraries’ role in services for immigrants or first-generation Americans. The pattern also carries over when people think about the library’s role in helping learn about new technologies, find health information or how to decide what information to trust – particularly when focusing on the share of people who say libraries help “a lot” in different realms. With respect to health searches, low-income Americans are more likely to say libraries help “a lot” in that area (44%), compared with 36% of all respondents. African Americans and Hispanics also exceed the average. 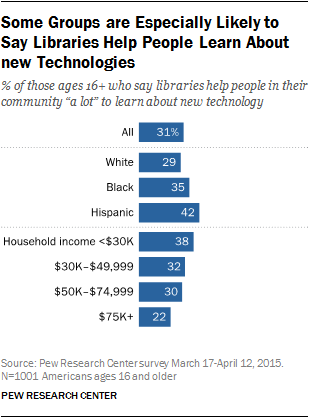 For learning about new technologies, Hispanics and low-income Americans are more likely than the typical respondent to see libraries helping “a lot” as they explore gadgets and applications, with African Americans above the norm to a lesser extent. Finally, with respect to trust and information online, Hispanics, African Americans and low-income Americans each see libraries helping people discern what information is trustworthy. It is little surprise, then, that lower-income Americans, blacks and Hispanics are more likely to say that closing their local public library would have a major impact on them or their family. About half (49%) of all Hispanics say closing the library would have a major impact on them or their family – far more than the 32% figure for all respondents. NextLibraries: What do Americans want from their libraries?